Today, we would like to tell you a story about a young man who has had more success and failure in his short 28 years then most people go through in their lifetime. Born in 1979, he showed early on his skills as a baseball player in his hometown of Ft. Pierce, Florida. By the time he was in high school, word was out that this young man was the real deal. He attended Port St. Lucie High School and went 11-1 with a 0.47 ERA during his senior season, striking out 162 batters in 74.0 innings pitched, and was named the High School Player of the Year by USA Today in 1997, and was also named 1st team High School All-American pitcher. We are talking stud material here folks. Scouts came from all over to watch this young man pitch in his high school games. When he graduated high school he signed the fifth highest contract ever given to an amateur player, $2.5-million. In 1998 he was Carolina League All-Star starting pitcher, Baseball America 1st team Minor League All-Star starting pitcher and voted the best pitching prospect in both the Carolina and Midwest leagues, and was named Minor League Player of the Year in the baseball organization for whom he played. In 1999, he was named the Minor League Player of the Year by both USA Today and Baseball America. He was also Texas League All-Star pitcher, Double-A All-Star starting pitcher, Baseball America 1st team Minor League All-Star starting pitcher and for the second year in a row, was named the Minor League Player of the year for his baseball organization. Some scouts considered him to be one of the best left-handed pitching prospects ever! Think about it, for those of you who we have not put to sleep already. The BEST prospect EVER...that is an incredible mantle to have hung on you. In 2000, he became a major leaguer at the age of 20, the second youngest player in all of the major leagues that year. Did the pressure of pitching against major leaguers affect his ride to history? Not in the least...He posted an 11-7 record and was 9th in the National league with a 3.50 ERA and 7th in the National League with 194 strike-outs in 30 games. The most impressive of his stats showed his dominance over hitters - he struck out batters at a rate of 9.98 strikeouts per nine innings (second in the National League only to Randy Johnson), and allowed only 7.05 hits per nine innings (second only to Chan Ho Park). He came in second in the NL Rookie of the Year voting. That year his team was in the NL Central Division Championship series. His manager wanted to protect his young phenom and had another pitcher on the team go to the media interviews as if he would be starting game one of the series. His manager had other ideas, however, and our subject was slated to be the starting pitcher in the first game of the series. In the top of the first inning, he walked two batters as well as allowing a single, but escaped without giving up any runs. In the bottom of the inning, his team staked him to a 6-run lead. In the second inning he stuck out the first batter, gave up a double and then got out of the inning without a run scoring. Things were looking good again. His stuff seemed to be coming together after rookie jitters. At this point our subject was replaced and the new pitcher got out of the inning without further damage. After the game, our subject joked that he had made history tying the record for 5 wild pitches in one inning set by Bert Cunningham in 1890! In Game 2 of the National League Championship Series against the New York Mets, he threw only 20 pitches. Five went past his catcher, including two official wild pitches. He appeared again in the seventh inning of game five, facing four hitters, walking two, and throwing two more wild pitches. His team lost the series four games to one to the Mets. His roller coaster ride continued when he returned to the majors in 2001 but again had issues controlling his pitches, walking 25 batters and throwing 5 wild pitches in 24 innings, and was sent down to AAA. Here his problems snowballed. In 4.1 innings, he walked an amazing 17 batters and threw 12 wild pitches, accumulating an ERA of 20.77. He was sent all the way down to the Rookie League to Johnson City, where he was successful as both a starting pitcher and a part-time designated hitter (sporting a .638 slugging percentage with 10 home runs and 35 RBIs in 105 at bats). Appalachian League All-Star designated hitter. All of these awards in the Rookie League after almost winning the Rookie of the year award just the year before in the National League. In 2002, he missed the whole season with a left elbow sprain. 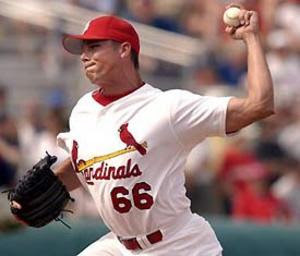 After being cleared to throw off the mound in December of that year, he returned to the minors in 2003, posting a 6.20 ERA in 10 starts before undergoing, in July, season-ending Tommy John surgery for his left elbow. In 54.1 innings he walked 49 batters and threw 10 wild pitches. He returned to the majors in September 2004, posting a 5.40 ERA in five relief appearances. Maybe ... just maybe... his control was impressive, as he walked just one while striking out nine in ten innings. In the minors, similarly, he walked only 2 batters in 23.2 innings, while striking out 23. It looked like the mental block he had developed was finally lifting. After a good winter pitching in the Puerto Rican Professional Baseball League, our subject suddenly announced that he was switching to the outfield for the 2003 season, after an unsuccessful practice outing in which his wildness reappeared, as he threw only three strikes out of 20 pitches. That year he slugged .514 in single A, and .515 in double A, with 5 outfield assists in 55 games. In 2006, he was invited to spring training as an outfielder, with little chance to make the major league team, but impressed all who saw him with his fielding ability and flashes of power at the plate as a hitter. He hurt his knee before the season began and sat out the entire season recuperating. This past spring, he was once again invited to spring training with the major league club though the manager insisted he would begin the season in AAA because "It isn't because he isn't capable, but unless you can guarantee that he would get 400 or 500 at-bats, it would be a bad move for him and for us." He was named a starting outfielder for the 2007 Triple-A All-Star Game. As of this past Wednesday, he had 32 home runs, 89 RBIs and was hitting .267, including a 3 home run performance on June 16th at Iowa. Defensively, he has 7 errors in 95 games. He is the current HR leader in the Pacific Coast League. Yesterday, our subject was called up to the majors to be the starting right fielder and will bat 2nd for the St. Louis Cardinals, the organization he has played for his entire career. Ladies and gents...the incredible roller coaster ride of Mr. Rick Ankiel. We here on THE COUCH wish him all the luck in the world. This young man is a remarkable athlete having shown brilliance and then worked his way back over the last six years to once again achieve his boyhood dream of being a major league baseball player. A HOLLYWOOD SCRIPT IN THE MAKING! 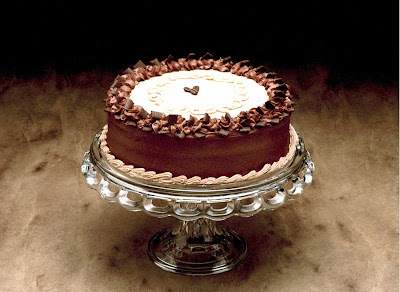 Just dropping by from Oger's to say hey....and thanks for the cake!!! Didn't know this story...my, my...you are a wealth of baseball information!!! And to top it off with CAKE????? A perfect ending!! SMOOCH and have a great weekend - stay cool!!! And this is why you got that Thoughtful Blogger Award isn't it? There you go again, bubbling over with knowledge beyond the basic level. AND you brought cake. Sheesh - what are you trying to do? Win Blogger of the Decade? Enough, Vin, enough! We all get it - you are DA MAN. A KING among kings. You also my friend..enjoy the remaining days of your vacation. 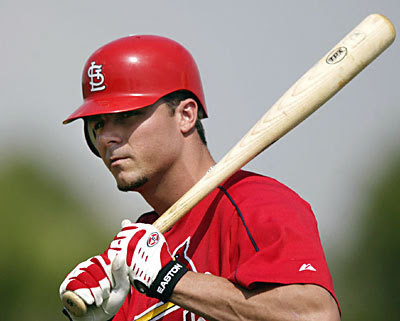 Go Rick Ankiel!!! 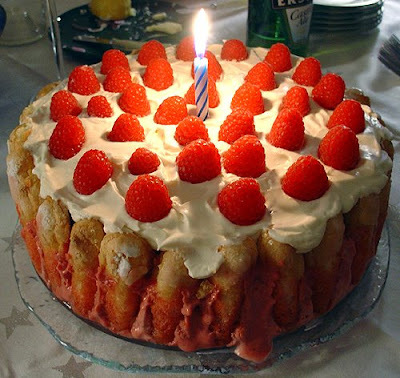 Hey good music baseball and cake thats a great post! Now I just need a beer to wash this cake down with...Have a awesome weekend Bond! He has been an interesting story. 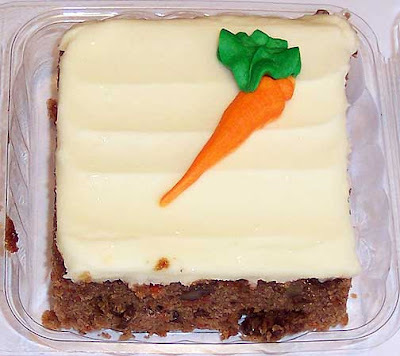 Mmmmmmm, Carrot Cake. Cheers!! The carrot cake looked yummy ... and btw, while I'm here? You've been tagged! awww bond, how sweet! the cake is a wonderful treat honey!!! yay you! have a great weekend. I may have to get out more, because I knew who you were talking about as soon as the wild pitch part hit my eyes. COCO: Looked yummy? Didn't you try some? SPARKY: YOU need to get out? What does that say about me??? I wrote the dang thing! I've kept a partial eye on this guy for some time now. I watched that wildness in the playoffs...it was so painful to witness. But he handled it well, even as the mental block developed. And then came the injuries, the switch to the outfield, another injury. Anybody who sticks with it like he did deserves at least a chance. Glad to see him get it. TRAVIS: Are you not feeling well? What is wrong? I know you are under the weather....you did not mention the CAKE!!!!!!!!!!!!! Dammit! I just got home from New Seasons and if I had seen this before I would have gotten carrot cake. he's cute :) but not as cute as you of course! Now there's the cake I wanted!! The chocolate looks divine. Save me a slice, please. SPARKY 3-4 with hose two HRs and a really nice catch in the OF, though I think he took the wrong route and made it tougher than it needed to be....OH to have the film rights! I used to be such a baseball fanatic, but I haven't been able to tolerate it for the past 10-15 years. And Mr. Steroid taking the home run record pretty much put the final nail in baseball's coffin for me.